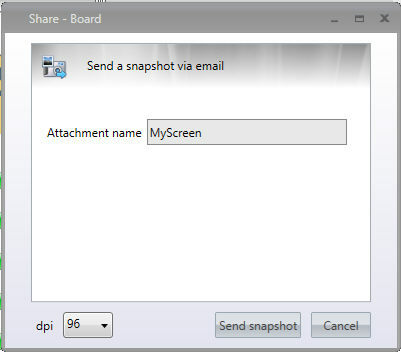 The "Share" Action in the Board Button Menu facilitates the cooperation among the Board Users Community providing the capability to share Screens. Clicking this option an image of the screen will be generated, the user will be asked to give a name to the attached image and to choose the dpi level. An email message with the attached image will be prompted, ready to be sent. Just like in the previous option, the user will be asked to give a name to the attachment, this time the attachment won't be an image, but a ".board" file, that can be open via double click from anybody that has installed a Board client on his laptop. 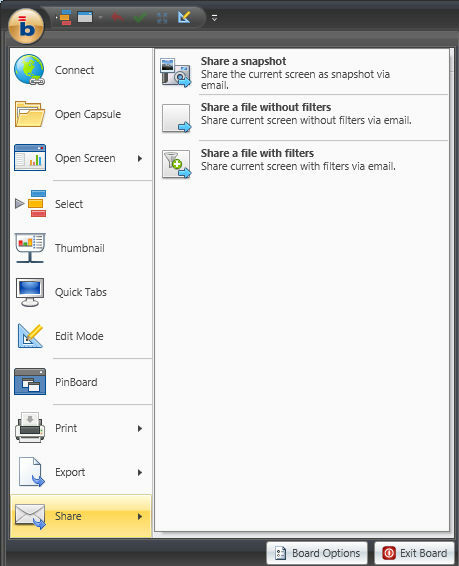 The screen will be sent with no screen selection if the user clicked on "Send a file without filter", the current selection will be applied if the other option ("send a file with filter") will be chosen.